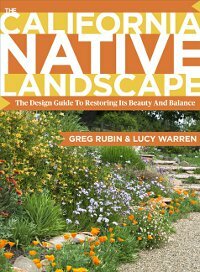 Welcome Greg Rubin and Lucy Warren, co-authors of the recently released comprehensive guide to landscaping with California native plants, The California Native Landscape: Homeowner’s Design Guide to Restoring its Beauty and Balance. In their first full presentation since the book’s release, they lead us behind the scenes of this groundbreaking new resource. Their completely different approach to native plant landscaping explodes the myth that home landscapes composed of native plants are scruffy and difficult to manage. By focusing on horticulture attuned to native plants and by emulating natural ecology, the authors show how to create easy-to-maintain native gardens that are beautiful year round. Greg Rubin is owner of California’s Own Native Landscape Design. Although his formal education and background is in engineering, his fascination with California native plants started when he renovated his parents’ home in Chatsworth, CA in 1985. Soon he was landscaping for friends and family on weekends and holidays. In 1993 he began his successful landscape business and the design of over 600 native landscapes in San Diego County. Lucy Warren, who has an extensive background in marketing research and her own consulting firm, has been long fascinated with plants and horticulture. She is a UCCE Master Gardener and an experienced garden writer who authored a column on edible plants for the San Diego Union-Tribune and served as editor of California Garden magazine. She is the assistant coordinator for the Flower and Garden Show at the San Diego County Fair and the Spring Home/Garden Show and is a board member of the San Diego Horticultural Society and the Pacific Horticulture Society. Her current interest is the replanting of Bird Park in Balboa Park with native plants. Las Pilitas Nursery has donated plants for a silent auction. Bring your native plants and flowers to share with members on the Plant Display table. Native plant experts will be available to answer questions. If you are looking for graduation, Mother's Day or Father's Day gifts, we'll be selling Debra Prinzing's The 50 Mile Bouquet and Ivette Soler's The Edible Front Yard. $20 for the pair.